Jandy Pro Series JE line of premium heat pumps deliver maximum energy efficiency and reliability. Working efficiently, JE Heat Pumps absorb free heat from the air and transfer it to the water, making the heating process ecological and cost effective. 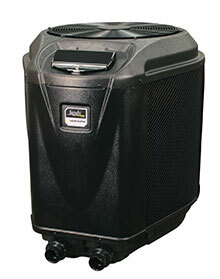 Featuring a premium titanium heat exchanger, JE Heat Pumps provide superior hydraulic flow for maximum energy savings. Easy to operate Dual Thermostats (Pool/Spa). All JE Heat Pumps are Versa Plumb ready, allowing you to achieve 50% more hydraulic efficiency for maximum energy savings. 3 standard models available: JE1500T, JE2000T, JE2500T. 3-Phase model available. Also available, JE3000T, an ultra-premium model featuring optional chiller mode.